iPhone 6 Plus/7 users after upgrade to to iOS 11 or iOS 11.2 and iTunes 12.7 finds that the iphone won't play my personalized ringtones. They are still there in iphone but will play when I look at them in Sounds/Ringtone and one of them still shows as the selected ringtone, but when a call comes in, it goes to the default Opening. Same issue on iphone 7, IOS11. Ringtone is defaulted but doesn’t play anymore, even for the alarms. Interestingly 7 the custom ringtone plays under Sounds but I get default tone when the phone is actually called. The ringtones play in the sound setting but won’t work as a ring tone and user Can't play ringtone in iOS 11 after upgrade. The loss of support for 32 bit apps is a big drawback in iTunes. 1. Tried setting custom ringtones for specific contacts (no resolution). 2. 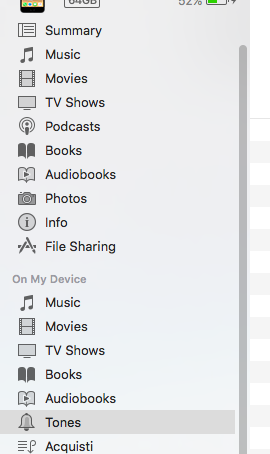 Confirmed the tones play in iTunes when my phone is connected to the computer. 3. Completely removed the ringtones from my device, synced/rebooted the phone, and manually re-added them per the new means of manually managing tones (no resolution). 2) From within iTunes, with my iPhone connected, select "Tones" under "On My Device"
5) From my iPhone, choose Settings -> Sounds -> Ringtone: confirm that the missing custom ringtones have been restored and that my default ringtone has been automatically set back to the (now no longer missing) custom ringtone it used to have. Looks like half my custom ringtones work and the other half do not. The ones that do not, Apple has tagged as "purchased" (right-click > item info > file) even though they were not. They were created in iTunes from songs which came from a CD Rip. Unsure how to get around this, but I am investigating. The ones that do work, are not tagged as such. Just downloaded an older version of itunes on my pc, and check if it solves the problem. 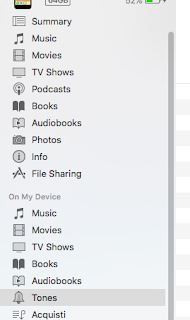 if you have a itunes music library from the newest version of itunes, find it on C:/users/"username"/musics/itunes and delete it before you start the itunes. after that its just easy as then. do not update itunes until the problem is fixed.